The new Creative Suite training series is 8.75 hours long and covers everything from setting up Photoshop for web layout to adding social feeds and finishing touches. InfiniteSkills unveiled its latest addition to their training library, the Adobe Creative Suite Web Design Tutorial Video, a comprehensive course that includes a range of lessons appropriate for beginners and advanced users alike. In 101 lessons, the new tutorial video prepares users on each aspect of website building, from creating the basic wireframe in Illustrator, establishing the graphic design in Photoshop then exporting it to Dreamweaver for final development, in simple and intuitive steps. The Adobe Creative Suite web course is divided into 11 chapters demonstrating each major part of the development process. After a brief introduction, veteran instructor Geoff Blake shows the user how to establish the layout file, put together a wireframe and export it for further development. Blake offers expert suggestions on website aesthetics and addresses the functional aspects of the site, from building a menu system to incorporating social media extensions and interactivity. The training video then discusses adding photos and textures in the layout to finalize the design stage. Next, the tutorial video covers how to convert the Photoshop layout to HTML, the principles on element slicing and then further layout enhancements within Dreamweaver. Blake then demonstrates how to define and arrange the site before merging the Photoshop design into Dreamweaver. Finally, Blake’s course gets into the details on how to build a self-running multimedia slide show in Flash, and the tutorial video ends with putting the final touches on the website. In addition to the Adobe Creative Suite Web Design Tutorial Video, Geoff Blake has created over 30 training videos on topics in development and design. He is known for combining an easygoing presentation style with years of expertise as a designer in both print and web-based industries. 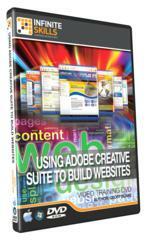 The Using Adobe Creative Suite to Build Websites Tutorial Video is available for purchase for USD $99.95. The complete training can be downloaded directly from the InfiniteSkills website or ordered in DVD-ROM format, and both editions are compatible with Windows and Mac systems. A broad range of sample videos are available for online viewing, and they include some of the best lessons from the course. InfiniteSkills is a leading provider of video training on popular software, programming languages, and technical skills featuring the best technology teachers and tutors in the world. In addition to training on DVD, the company has actively pushed to publish its tutorials to eLearning and mobile app formats.